My Thoughts: The color of the cover is darling. It is a dark blue with stars all around. The dark blue theme continues to the inside cover and the tops of the pages. It plays on the bedtime theme well. Each new theme that is introduced is on a cute page with the Bear family standing in front of the moon. 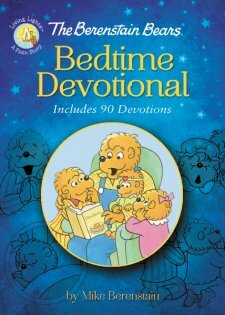 I like how the nighttime theme is carried throughout this devotional, most likely meant to get young ones in the mood for sleep! The themes are relevant for young ones, God Loves You Very Much, Be Forgiving and God's Gifts and Blessings are a few that stood out. The devotions include a scripture, story, thought provoking question and prayer. I wasn't sure which age range this would be geared towards but I would say younger elementary. This would certainly make an adorable gift this Christmas!